When thinking brings pleasure. When thinking brings pleasure? : The Uncertainty Principle: a contemporary formulation. The Uncertainty Principle: a contemporary formulation. When the uncertainty principle was introduced (Werner Heisenberg, 1927) quantum mechanics was in the state of active development. Scientists had heated discussions about many strange aspects of the new science. For physicists of that time any deviation from classical Newtonian mechanics was mind bending. Trying to merge the old and new realms of physics they have invented many new concepts which at the time help to propel the discussion toward a better common understanding. those concepts have been passed from one generation of physicists to another. However, some of those concept do not have so much of importance anymore as they had it during the years of the building of the new theory. Uncertainty Principle, or a wave-particle duality are examples of such concepts. Almost a hundred years later physicists know much more about the fundamental properties of quantum matter. However, the popular literature still uses the old and outdated, and basically wrong formulation of the uncertainty principle, such as: “Heisenberg's uncertainty principle posits that there is a fundamental limit to the precision with which so-called complementary variables, such as position and momentum, can be measured. That is, the more accurately the speed and direction (and thus the momentum) of a quantum particle are known, the less certain we can be about its position.” (from “Easing uncertainty: How Heisenberg's uncertainty principle can be relaxed” // April 2, 2018 https://www.sciencedaily.com/releases/2018/04/180402123248.htm). 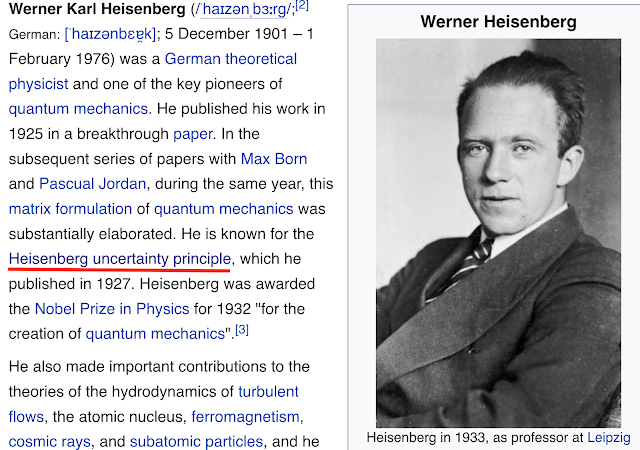 The Wikipedia.org offers a disclaimer, like: “It must be emphasized that measurement does not mean only a process in which a physicist-observer takes part, but rather any interaction between classical and quantum objects regardless of any observer” (https://en.wikipedia.org/wiki/Uncertainty_principle), but this disclaimer does not say anything to a non-physicist (and even to some of the physicists who don’t give much thoughts on the matter). The problem with the common formulation of the uncertainty principle is that it uses such words as “measurement”, “known”, “we”. This makes an intelligent being, an observer, to be a central part of the principle. However, as scientists believe, natural phenomena do not depend on our knowledge about them, natural phenomena cannot depend on the presence or the absence of any intelligence. That means that any law or a principle has to be formulated in a way independent of the presence or the absence of an observer, a scientist, a human being, or an alien intelligence. This is why it is important to formulate the uncertainty principle in such a way that it would not be related to the presence or the absence of an observer. In order to arrive at such a formulation, we have to start from a brief (and very much simplified) description of the macroscopic world. The macroscopic world consists of macroscopic things – objects (or systems of objects). Each macroscopic object has certain properties and can be in certain states, which are described by specific parameters (physical quantities) which may have specific values. For example, a small ping-pong plastic ball has mass, can have electric charge, can be located in space (which is described by its coordinates), can change that location (which is described by its velocity), can be traveling faster or slower (that is described by acceleration), can be influenced by other objects such as the Earth, a racket, a wall, the air (that influence is described by various forces). For a set of several objects interacting with each other there is a set of very important quantities which may change for different objects, but (under certain circumstances) stay the same for the whole system (energy, momentum). The set of quantities which describe an object as that object is usually called properties: for example, for a ball, the properties are described by its mass (and charge; or its color - but that property is not so important for a physicist). The set of quantities which describe what may be happening to an object is usually called a state: for a ball that would be its coordinates and velocity (or linear momentum, or kinetic energy, or ...). The same object may have different states; for example, the same ball (i.e. a small object with the same mass and charge) can have different locations, can change those locations. For a macroscopic object all physical quantities (describing both, properties and states) can have certain value simultaneously, i.e. at the same time. There is a special procedure which assigns a specific value to each quantity, and called a measurement. A measurement is an interaction between two objects each of which has the same quantity; the amount of the quantity of one object is set to be "a standard" and usually is set to be equal to one (that object is called a standard, or an etalon); and the interaction shows how much of the same quantity the second object has (relative to the standard). The simplest example is measuring the mass of an object. There is a standard of mass, called a kilogram. All other objects can be compared with one kilogram, and the result will be the number of kilograms in those objects (there are many ways to make that comparison, it does not matter how exactly the comparison would happen; for example, could have been done by using the same spring, or a calibrate spring, a.k.a. a spring scale). 5. the behavior of the objects during and after interactions depends on the amount/value of a quantity (quantities) each object has in a regular way (i.e. according to some repetitive pattern; the same objects in the same circumstances under the same conditions behave in the same way). That regular way (a pattern) usually allows to establish a mathematical relationship between the values of some physical quantities of interacting objects (often called a law, but may be a definition). 1. for all macroscopic objects all physical quantities can have their values (hence, measured) at the same time. 2. no matter how many identical microscopic systems exist, in the same macroscopic conditions (the same objects in the same states) they all will have the same values for the same quantities. For example, if 1000 identical ping-pong balls are released from rest from 20 m above the ground (on the Earth), they all hit the ground about 2 s later with the speed about 20 m/s. The macroscopic world is important for us, humans, because we, humans, belong to it, too; we are also macroscopic objects, and as such can also be used as standards for measuring various quantities – the only issue with it is that we are not very accurate measuring devices (we could hold a ball in our hand and try to guess its mass, but that would not be as accurate as using a scale). That is why when we need to measure values of some physical quantities we do not use our bodies for that, but instead we use other objects, and then we use our bodies to interact with those other objects (mostly via light, i.e. by watching; e.g. like looking at a spring scale). Now we are ready to go into the microscopic world, the world which is governed by the laws of quantum mechanics. Microscopic objects also have properties and states. But those properties and states may differ from properties and states of macroscopic objects. For example, microscopic objects can have a spin, but no macroscopic object has it (what is a spin does not matter for this conversation; it is just an illustration of something what a macroscopic object cannot ever have, and microscopic objects can). Microscopic objects can interact with other microscopic objects, and those interactions obey quantum laws (e.g. the Schrödinger equation). And, of course, microscopic objects can interact with macroscopic objects. The mathematical description of such an interaction, however, usually is much more difficult than the use of the Schrödinger equation. But the description of the results of such an interaction is rather simple. Sometimes when a microscopic object interacts with a macroscopic object, again and again under the same macroscopic conditions, that macroscopic object always demonstrates for a certain physical quantity the same value. If that happens, the microscopic object exists in a pure state with respect to that physical quantity. Sometimes when a microscopic object interacts with a macroscopic object, again and again under the same macroscopic conditions, that macroscopic object demonstrates for a certain physical quantity many different values (i.e. a distribution of values). If that happens, the microscopic object exists in a mixed state with respect to that physical quantity. Turns out, that for many microscopic objects some quantities can exist in pure states at the same time, i.e. a macroscopic object interacting with the microscopic object always repeats/shows/has the same values for two (or more) quantities (for example, for a linear momentum and kinetic energy of an electron in a vacuum tube). Two quantities like that are called commutative. This behavior looks normal for macroscopic objects, because for them all quantities deliver the same values under the same conditions; for all macroscopic objects all quantities are commutative. However, for many microscopic objects some quantities cannot exist in pure states at the same time, i.e. a macroscopic object interacting with the microscopic object never repeats/shows/has the same values for those two (or more) quantities (for example, for a linear momentum and a coordinate of an electron in a vacuum tube). Even when a microscopic object exists in a pure state relative to one physical quantity, it will never be in a pure state (only in a mixed one) relative to another one physical quantity. Two quantities like that are called non-commutative. The existence of non-commutative physical quantities is one of the most important properties of the quantum world; non-commutative quantities do not exist for macroscopic objects. Now, finally, we can formulate the uncertainty principle in its contemporary meaning. For any two non-commutative physical quantities, the narrower is the distribution of the values for one of the quantities, the wider is the distribution of the values for another one. We need to stress again that the term “the distribution of the values” means the distribution of values of a specific physical quantity of a specific macroscopic object which interacts with many identical versions (one at a time) of the same microscopic object (or a system) under the same macroscopic conditions. 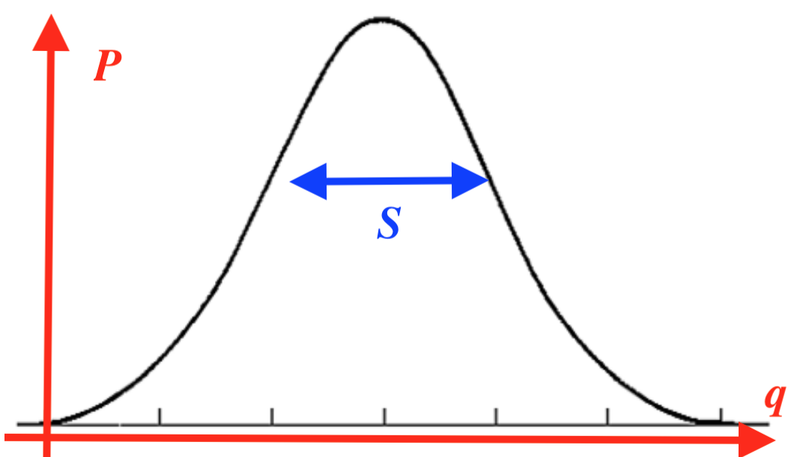 This distribution usually can be represented by an equation or a graph, which in a simple case is similar to a well-known Bell curve. In the picture, q represents possible values of the quantity, P represents the probability for a macroscopic object to have that value after interaction with a microscopic object, S represents a parameter which characterizes the width of the distribution P(q). Using such parameters there is a mathematical expression which represents the uncertainty principle for two non-commutative quantities: S1*S2 > or = Const. For some special pairs of non-commutative quantities, called “complementary” that constant is equal to a specific value, h/(4π), where h is the Max Plan Planck’s constant. What especially interesting is the fact that the Schrödinger equation allows to calculate a special function, "Psy", called, a wave-function of a microscopic object (a system), which has a simple direct mathematical relationship with the distribution, P(q), namely P(q) is proportional to |Psy|2. However, the Schrödinger equation a physicist solves to study a microscopic system describes only the microscopic object (system), and does not describe its interaction with the macroscopic object (in genera, the equation could be written for a super-system, but no one could solve it, so far). It looks like all microscopic systems “know” that eventually they will be interacting with some macroscopic systems and prepare their properties in such a way that the future interaction would yield for the macroscopic systems the right distribution of the values. Of course, the previous sentence does not make any sense, and only demonstrates that even today, almost a hundred years later after the birth of the quantum mechanics, we, scientists, still do not understand some of the fundamental aspects of that theory. At the beginning of this piece I also mentioned a wave-particle duality. It was invented to "reconcile" particle-like existence with wave-like behavior of quantum objects. Now this concept lost its usefulness. There is no duality, all quantum objects are particles, but they may behave in such a way that looks like a wave. There is also a question about how fundamental the uncertainty principle is. For example, there is a simple experiment which shows an apparent violation of the principle. When charged particles (e.g. electrons) travel through a device called a velocity selector, only those electrons with a specific speed imposed by the device (designed by scientists) will travel through the device. Hence, after passing the device all particles travel with the same well-established speed. Then those particles can reach a photo-plate (or a screen) and their location will be registered. And the better the velocity selector is tuned up, the more accurately the location will be registered. It looks like for those electrons (or other charged particles) both quantities, speed and coordinates, have certain and repeatable values at the same time. Maybe very accurate calculations will demonstrate that the uncertainty principle is still valid in this experiment, but on the surface, it looks the opposite. However, in quantum mechanics many things which look fine (or counterintuitive) on the surface have nothing to do (or do) with the reality. There is a quantum phenomenon called quantum entanglement. It is known for the same amount of time the uncertainty principle is known, and its exact meaning is still under debates. One of the interpretation of quantum entanglement is that quantum objects can “feel” each other even if they are far away apart from each other. In order to be able to “feel” each other those particles have to be specifically prepared, i.e. entangled. We all know, however, that all existing particles have been specifically prepared – that happened at the “Big Bang”. Hence, we can assume, that all quantum particles “feel” each other all the time. This can “explain” how quantum particles “know” that they will interact with a macroscopic world, because, essentially, they constantly “feel” the whole world, which is huge. 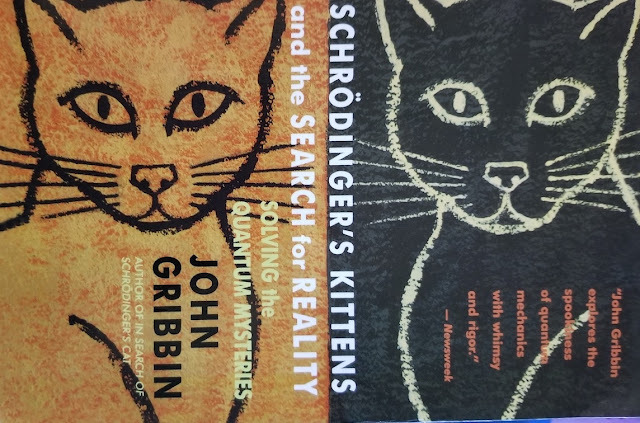 Of course, this interpretation of quantum entanglement also can be used to “explain” telepathy, telekinesis, and all known and yet unknown “psychic phenomena”. This book, however, as many other books on the matter, are completely misleading when they start talking about single-photon experiments. the Schrodinger equation is not relativistic. It is like analyzing length contraction or time dilation to better understand how Newtonian mechanics works.